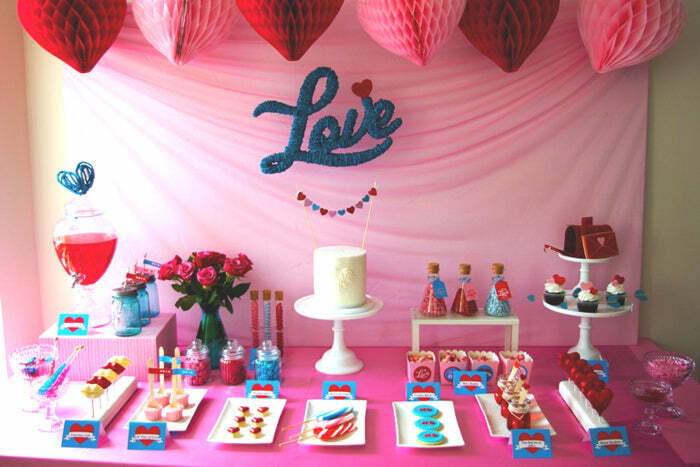 Valentine’s Day is one of our three candy-related holidays, so how could we pass up an opportunity to put on display some of the best Valentine’s Day candy buffets? Make no mistake: creating a good Valentine’s Day buffet is no simple chore. There are few color choices — red, white, and pink mostly — so you have to get creative in order to make one that stands out. 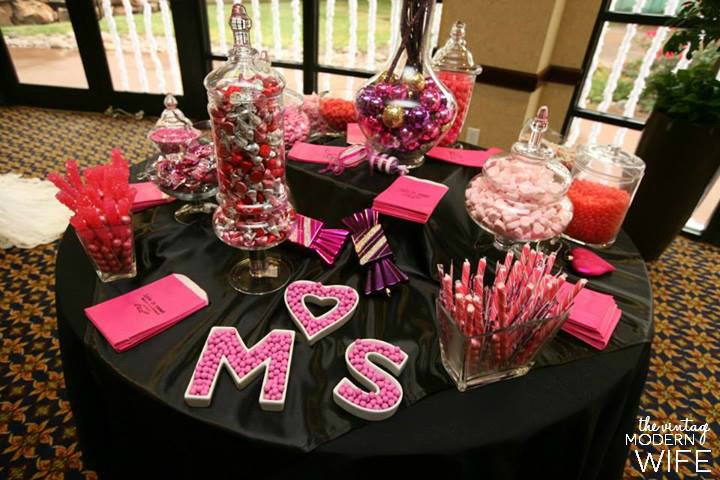 Check out these 11 V-Day buffets to get ideas for your very own. We’re sure that with some inspiration and ingenuity, you can create some awesome displays that will wow your friends and family. Hilary at Measure Once, Cut Twice didn’t create a typical candy buffet. While buffets are usually created for consumption during a specific event, Hilary created one that is more of a seasonal display. 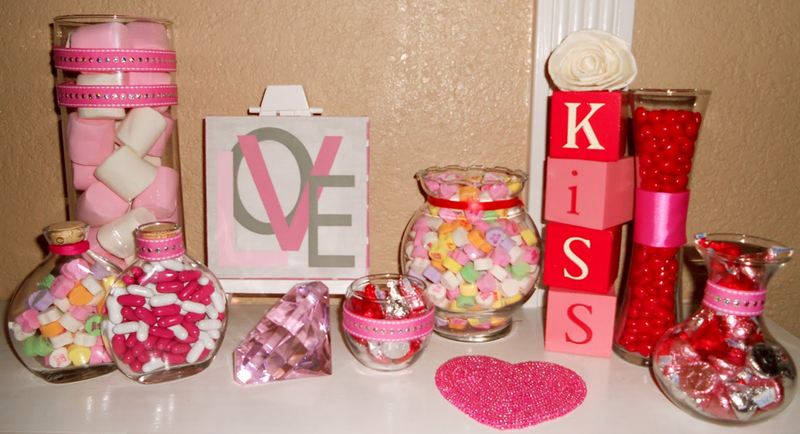 Her jars of candy hearts, marshmallows, and Good and Plentys (great choice!) line her mantle, so people visiting at any time in February can enjoy it. Check it out: Measure Once, Cut Twice. 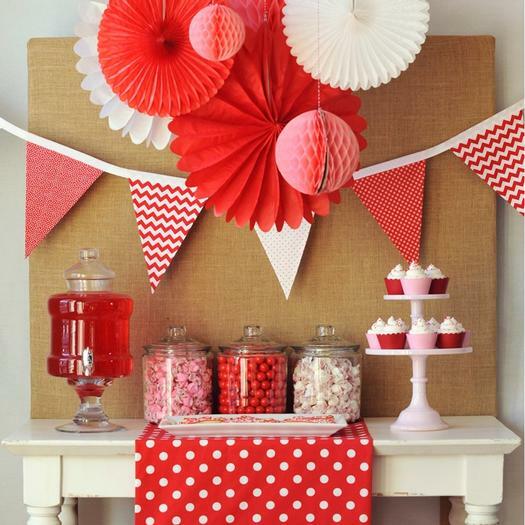 You don’t have to make your Valentine’s Day candy buffet red-and-white themed, but it sure doesn’t hurt. 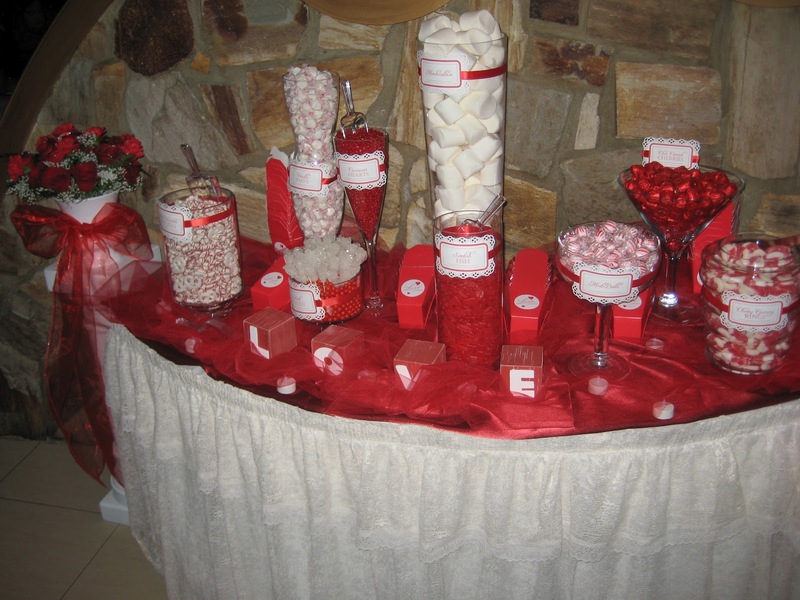 Mimi from Parties by Mimi put togehter a wonderfully two-tone buffet, featuring many of the candies we most associate with Valentine’s Day. The addition of the gummy rings is a nice little touch, as is the taffy (which, lucky for her, has red labels). Check it out: Parties by Mimi. Amy Atlas’s blog is frequently an inspiration for candy buffets, and this one, submitted by Styled By Bella, is no exception. Instead of sticking with the two-toned theme, this buffet adds blue to the mix, creating a warm and vibrant display. The candies themselves are pretty creative, too — you’re not going to find wrapped mints at this buffet. Her candy buffet supplies are top notch. Check it out: Sweet Designs. 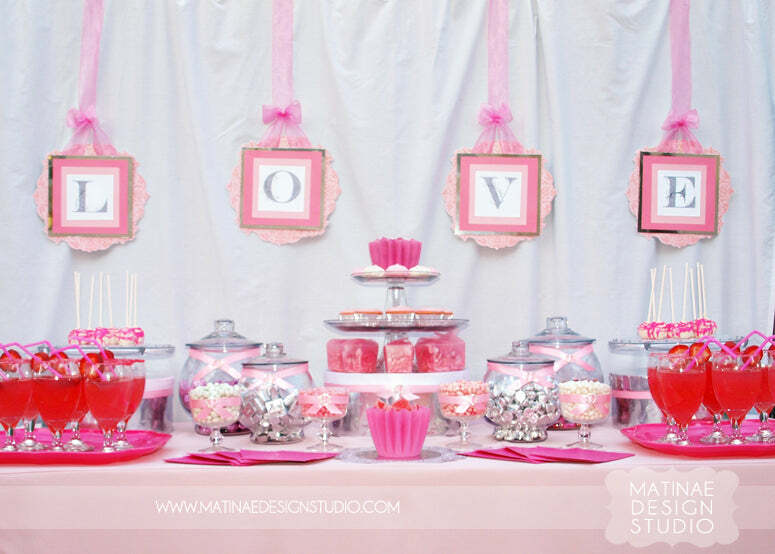 To this point we haven’t seen much pink in our buffets, but this one from Matinae Design Studio makes up for it. This pink spread stretches the bounds of buffets. It includes plenty of goodies, including macaroons and cupcakes. A neat little touch: the sparkling red drinks. They not only look great, but they’re perfectly placed. This one is so pristinely constructed that we almost don’t want to take anything from it. Almost. Check it out: Matinae Design Studio. 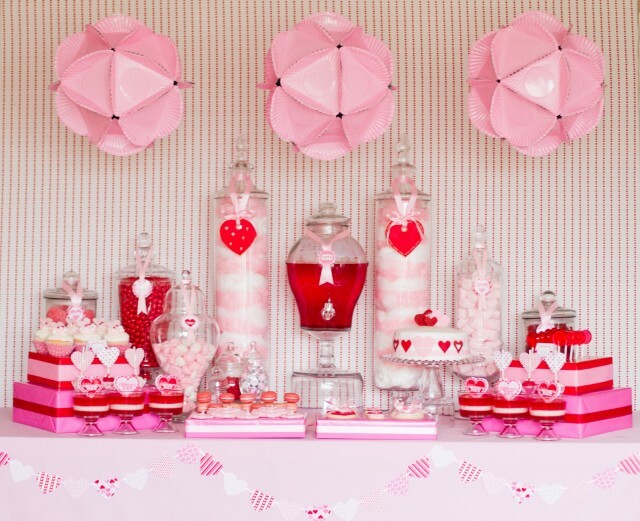 While some of these buffets have similar themes — there’s not too much you can do in terms of Valentine’s Day colors — each has a unique element. This one, by the Happy Wish Company upoaded to Hostess with the Mostess, has red drinks, like the previous buffet. But instead of drinks in glasses, this has a dispenser, which looks quit enice. 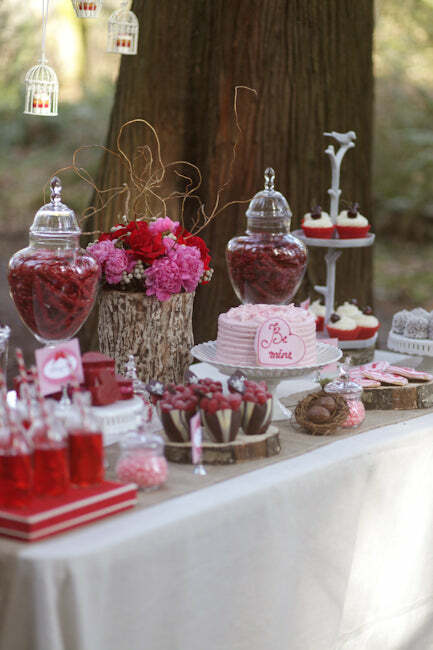 Combined with the jarred candies and cupcake trays, you can probably make this beautiful buffet with minimal effort. Check it out: Hostess with the Mostess. While all of these buffets are laid out in expert fashion, perhaps none is displayed as elegantly as this one from Anders Ruff. It has all th ebest elements of the other buffets, but is laid out in a visually stunning manner. 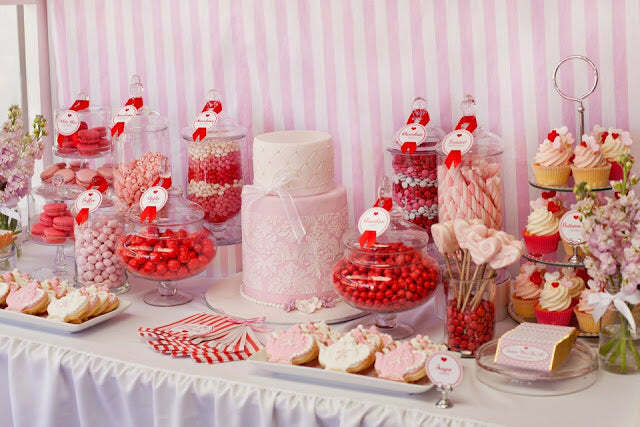 The buffet also has it all in terms of sweets: lollipops, meringues, cookies, cupcakes, cotton candy, and even a cake. 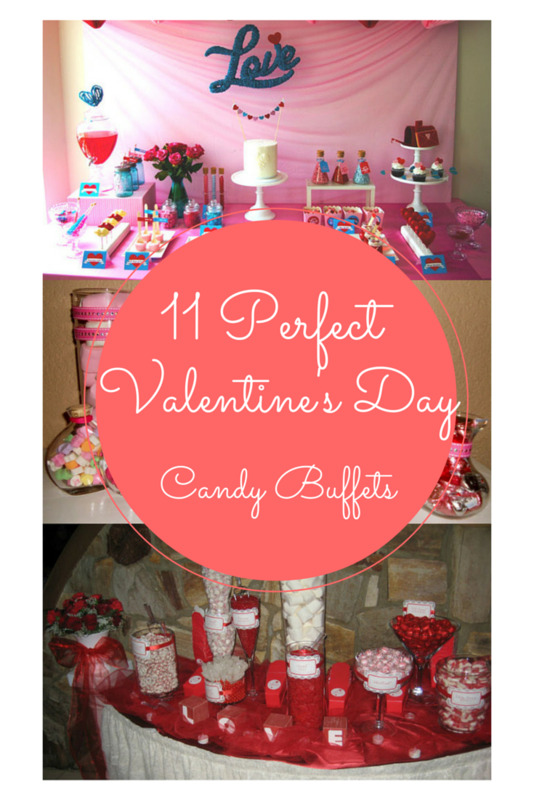 You can’t ask for much more out of a Valentine’s Day candy buffet. Check it out: Anders Ruff. Amy at Amy Giggles is up front with us right from the start: “This was actually our Christmas party dessert buffet, but I thought that there really wasn’t anything too “Christmas-y” to it and it would be great to share at Valentine’s Day!” It goes to show that you can repurpose buffet items for multiple events. 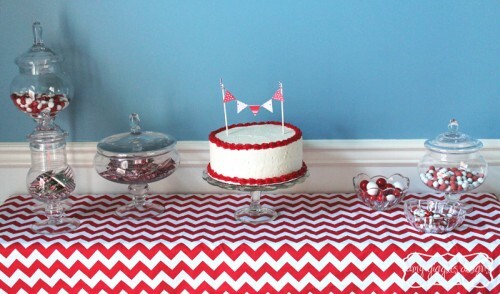 This one works well, especially with the red and white tablecloth. There is plenty of white space in this buffet, and the tablecloth fills those gaps. And yeah, we’re fans of the cake, too. Check it out: Amy Giggles Designs. Ms. Giggles isn’t the only designer with multi-purpose buffers. This one was actually for a bridal shower, but it works just as well for any Valentine’s Day party. This one wins the award for cake design. It’s perfectly simple, and perfectly placed in the middle of the display. The flowers really add to the elegance of this buffet, as do the subtle tones of red, pink, and white. Check it out: The Little Big Company. The Vintage Modern Wife shares a photo from her wedding, and it looks like they had a sweet time. 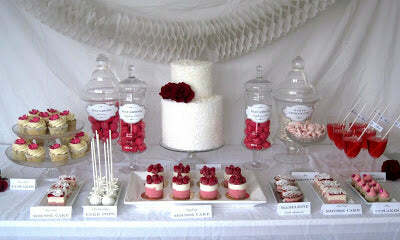 There’s nothing we don’t like about this display, and it works as well as a Valentine’s Buffet as it does for a wedding one. Maybe you get different letters for your candy dishes — we absolutely love that aspect of the buffet — but it works overall. Another thing we like about this: it’s round, rather than flat, meaning there is more edge room for the candy displays. Check it out: The Vintage Modern Wife. Our only wish is that the pictures were a bit bigger so we could more fully appreciate this buffet’s beauty. The pure white table and background give this a clean look, while there’s just enough red to give it a little life. This buffet goes to show that symmetry can sometimes be overrated. The ladies at Holy Sweet create an impression of symmetry with the cake and cupcake display in the middle, but create variety around the edges. Check it out: Holy Sweet. We hope that you’re in a place where you can hold an outdoors event for Valentine’s Day. In most areas of the country, you’re more likely to be bundled up in front of a cozy fire rather than enjoying a day with trees and birds. Elizabeth Anne is apparently so lucky, as she teamed up with some killer vendors to create this rustic Valentine’s Day buffet. It really has everything you could ask for, including plenty of chocolate and, of course, red licorice. We’ll have what they’re having, where they’re having it. Check it out: Elizabeth Anne Designs.